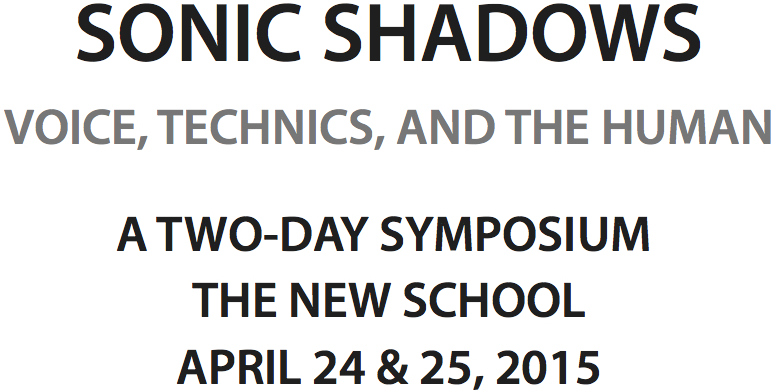 Sonic Shadows is a two-day symposium designed to foster interdisciplinary dialogue among scholars working on the topic of the voice across the fields of literature, film, theory, music, and technology. Our title, “Sonic Shadows,” is designed as a capacious point of entry that accommodates very different objects, approaches, and questions across media and literary studies, whether theoretical, philosophical, or historical. This concept urges us to consider the voice against its grain, as a form of intelligibility subtended by certain sonic frames. We also share a concern for the technologies that shape our conception of the voice and the human, as well as “other” voices that remain in the shadows of such conceptions. As such, we hope to find illuminating and unexpected polyvocal approaches to the voice’s shadowy, layered, coded quality, especially in relation to its habit of confounding our seemingly comfortable notions about race, humanness, gender, the body, the organic, presence, interiority, and mediality. The symposium will feature 7 speakers across two days. On both days, our conversation will follow a round-table discussion format. Each speaker will be allotted 90 minutes in which they will present a brief talk or work-in-progress, possibly accompanied by contextualizing reading. The remaining time will be reserved for in-depth discussion. Sonic Shadows is open to a limited number of auditors who RSVP in advance. To register as an auditor, please send an email to sonicshadowsinfo@gmail.com before April 21. By RSVP-ing, auditors agree to read the pre-circulated papers attached in the descriptions of the presentations below, and to attend both days of the symposium, to the best of their ability. Our hope is to have a sustained, immersive conversation over two days. Click on the names of the participants below to view descriptions and download readings.